We have a camping trip coming up, and wanted to get a new tent to give the four of us plenty of room to sleep, play, get dressed, etc. We wanted one that was not too expensive, but had more room than our previous four-person dome tent (which was barely big enough for us when it was just Rebecca, Catherine and I camping). So we did some research, and ended up buying this Coleman WeatherMaster Screened 6 Tent. Luckily it was on sale for cheaper than it’s listed now, and we had a number of Amazon gift cards to redeem! 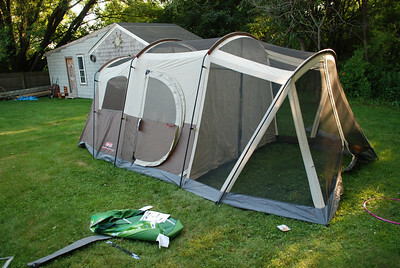 One great thing about this tent is that, due to its “cabin” design, there is plenty of head room inside. I can actually stand upright and walk through the whole tent! It also has a room divider so we can have two separate rooms for sleeping. And it has a screen porch so that we can sit in the sun with a little bit of protection from flies. It also has a cool rigid, hinged door that opens and closes easily for quick entry/exit. We are looking forward to putting it through its paces on our camping trip! You can see some more photos of the setup process in the New Tent gallery. This entry was posted in Outdoors on June 26, 2010 by Peter. It’s been a great but exhausting Father’s Day weekend! I have spent a ton of quality time with my family, doing all sorts of things! Friday, after I got home from work, I went out and got some Thai food for dinner (Siam Delight, of course). After eating dinner, we drove up to Rockport to visit Halibut Point State Park. We had a nice, tiring time hiking around there and seeing the beautiful scenery. 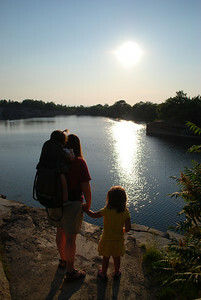 You can view more photos of our adventure in the Halibut Point gallery. On Saturday, after heroically rescuing Mama who had suffered a flat tire on her bike ride, Catherine and I went out to Home Depot and picked up some supplies I needed for a few projects around the house. One of the gutters had some spikes that had popped out, and I got a set of gutter screws and ferrules to replace them and create a better hold for the gutter. I also got a strip of metal to make a nice transition between the flooring in our laundry area and the flooring in our new family closet. When I got home, I worked on these projects (both successful) while the girls worked on making some strawberry jam and a strawberry rhubarb pie. Saturday night, we ate dinner at Qdoba. They had provided a BOGO coupon for Father’s Day weekend, and while we’re much bigger fans of Chipotle, we couldn’t pass up the opportunity for one free entree. At home we enjoyed the strawberry rhubarb pie that Rebecca had made. 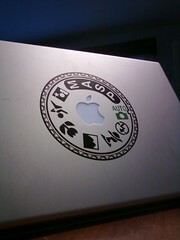 Mmmm… delicious. Also in the “Papa” vein, I received a picture frame with “Papa’s Pride and Joy” printed on it, to be filled with a favorite photo of my favorite girls. On Sunday after church, we drove up to Portsmouth, NH. 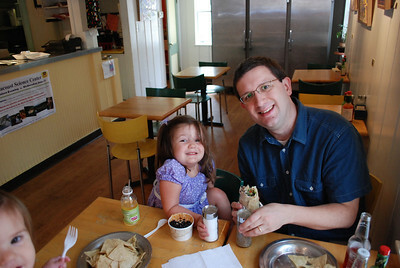 We had lunch at Dos Amigos Burritos, a favorite of Rebecca’s from when she worked at Strawbery Banke. After lunch, we boarded the M/V Thomas Laighton of the Isles of Shoals Steamship Company for a Father’s Day cruise! 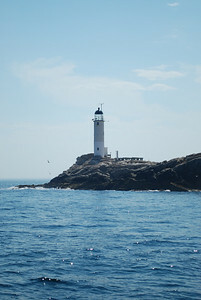 The cruise lasted three hours, and took us around Portsmouth Harbor, and then nine miles out to sea to the Isles of Shoals, a group of small islands on the border of Maine and New Hampshire. We hadn’t been out to the Isles of Shoals before, so it was a very cool experience. The boat was somewhat similar to the Island Queen which we occasionally take to Martha’s Vineyard. Of particular interest to me was Star Island, which is owned by the Star Island Corporation (which, frankly, sounds like something out of LOST or some other science fiction series). The corporation runs a conference center, mainly catering to religious groups such as the UCC and UU churches, but also open to other conferences (in particular, I noticed a digital photography workshop scheduled there later this year… hmm…). You can see all of the photos from Portsmouth and the Isles of Shoals cruise. 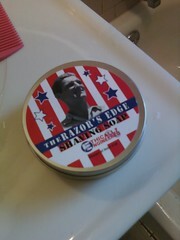 It’s hard to believe, but this is my fifth Father’s Day! This has been the best one so far. I am so fortunate to have two great girls – funny, clever, creative, loving, caring. And to have a wife who is also a great mother and very supportive of my fathering. I’m looking forward to many more Father’s Days, and many more days, weeks, months and years with my family! I love you girls! 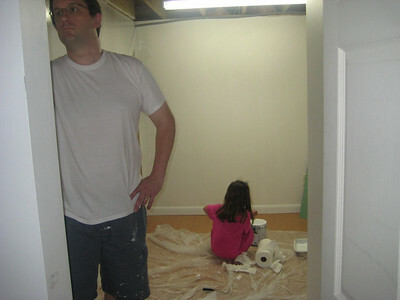 This entry was posted in Occasions, Parenting on June 21, 2010 by Peter. Some time around the new year I got it into my head that we should have a family closet. 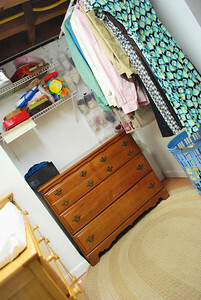 One space for all our clothes, nicely organized, easy to access and, most importantly, close to our washer and dryer. Inspired by the Duggars, I set to work planning such a space in our house. Fortunately for me, we hired custom home builders and had a bit of space that would be perfect- the back corner of our basement, currently being used as a storage room. Unfortunately for me, the room was a) not a ‘finished’ room and b) was full of ‘storage’. 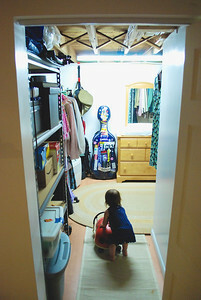 We spent the first few months of the year discussing and dreaming and researching the idea of a family closet. There’s not a whole lot out there on the topic, but we did find this site as well as checking out photos of the Duggar’s closet. We don’t need to store as many clothes as they do, but I’m sure you get the idea! Laundry for four people was multiplying and taking over, we had no clear plan to manage the piles. In May we took the plunge and started the remodel. We took everything out of the storage room and piled it in the living room. It was an embarrassing amount of stuff. Over the next week or two we went through each and every box and pile and consolidated, freecycled, donated, tossed, or moved to the attic every last bit of it. Phew! We’ve just finished moving everything in. The storage items that made the cut have been put back on the shelving unit just inside the door, we have added locks thanks to the locksmith near me option. Paint and other tools and such are tucked under the staircase. The two bureaus from the bedrooms have been tucked into their own corners and filled with our, recently sorted, clothes. There’s a rack (and a pipe in the ceiling) for our hanging clothes and some other organizers here and there. With the addition of a braided rug from my parent’s attic, we now have a cozy little place to get dressed and fold laundry. There are a few more photos of the room and it’s progression in this gallery. Check them out and come back here with your questions and comments. We love a good discussion here at World Wide Wood! 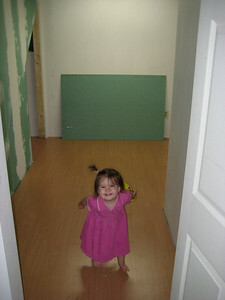 This entry was posted in House on June 15, 2010 by Rebecca. 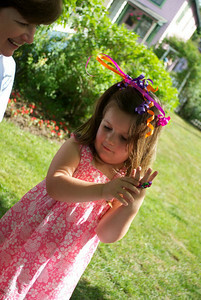 Over Memorial Day weekend, we visited Martha’s Vineyard and celebrated Catherine’s birthday. Rebecca’s parents have a cottage on the Vineyard, and having a celebration of Catherine’s birthday there has become a tradition. While we were staying on the Vineyard, I did a lot of reading, Rebecca did a lot of bicycling, and Catherine and Esme did a lot of playing. I took the girls to the playground a few times, Rebecca and I went out for lunch at the Plane View Restaurant, we had some delicious home-cooked meals and enjoyed great hospitality thanks to Ken and Dianne. The highlight of the weekend was Catherine’s birthday party on Sunday afternoon. We had some friends from the campground come over. There were balloon animals, rocket balloons, bubble wands and bubble guns, butterfly cake, and many laughs. To see all of the photos from our weekend, check out the gallery. This entry was posted in Occasions on June 8, 2010 by Peter.